I try to make a commitment to myself each year that in some ways does something to better the world around me. 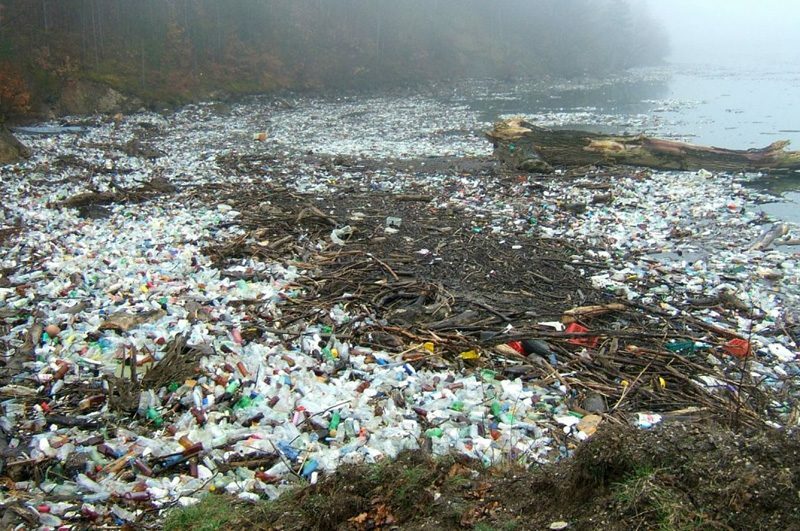 I’ve long been a recycler and in the past few years joined a composting program, but the sheer amount of plastic waste that can NOT be recycled continues to overwhelm me. After seeing so many news pieces lately focusing on this crisis, and seeing how those of who spend our time in a kitchen might be contributing to this problem, I decided to try to tackle this. I found out, it’s harder than you might think to reduce plastic in the kitchen. 1. Ditch the straw – you can read almost anywhere about the plastic straw crisis, and really is it that hard to drink from a cup? Use a spoon for thick drinks and just drink from the cup for thin ones. 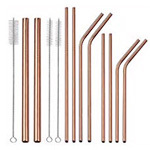 If you need a straw, invest in some fun reusable copper straws like I did. 2. Consider the packaging when buying packaged products. I needed to buy spaghetti recently and grabbed the brand I wanted, then noticed it was wrapped in non-recyclable cellophane type of packaging. I put it back on the shelf and opted for a brand in a cardboard box that I know I can recycle. 3. Ditch the plastic bags to put your produce in at the store – they are totally unnecessary! I simple pile the produce into my cart, weigh it at check out, and place it in my reusable shopping bags. At home it goes into my refrigerator’s produce drawers without being in a bag. If you really think you need your produce bagged, invest in reusable produce bags. 4. Carry reusable grocery bags – don’t think I need to belabor this point because this is old news, right? But remember, carry them for every kind of store, not just the grocery store. And whenever people try to bag something, just say skip the bag. 5. Freezing things in quantity can be a problem. Instead of wrapping everything in plastic wrap, spread the food out on a large baking pan and freeze, then pour them into a reusable container once frozen. 6. Figure out ways to cover something temporarily that doesn’t involve plastic wrap. When I roast peppers I used to put them in a bowl and cover with plastic wrap to steam. Now I just invert a second baking pan over the pan they roasted on and they steam just fine that way – no plastic waste! Often a plate can just be placed on top of a bowl overnight in the refrigerator. 7. Invest in reusable silicone covers for covering a bowl or cup temporarily instead of covering it with plastic. 8. Consider reusable silicone bags to store food that just doesn’t fit well into other containers. 9. Opt for buying food “bag free” when you can, because inevitably, those bags are plastic of some sort that largely cannot be recycled or reused – bread at the bakery counter, peppers individually instead of 3 to a cellophane bag, loose lettuce instead of bagged lettuce, etc. 10. 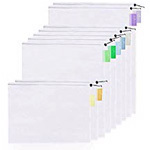 Replace any waste bags with compostable bags. You might already use the small 3 gallon ones for collecting food scraps for composting. 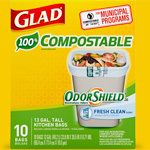 But you can also use fully compostable tall bags in your kitchen trash can. Plastic king Glad even makes them.